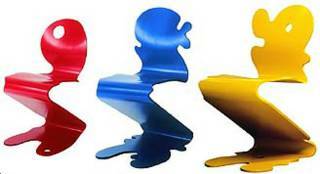 Xeni over at BoingBoing told me about her other Web site, Ambience Dore, where I found the Hag Pantonic chair. This is another one of those chairs that has "dynamic ergonomics," which means the chair moves when you do, and that’s supposed to be good for you. Read on. "An ergonomic chair is a chair that naturally follows you as you move to the next sitting position. It must obey the minor and major movements of the body and be at rest when the body requires it. When the chair follows the body it means you can concentrate on your work, at the same time as the body gets the appropriate nourishment for the active muscles. You are moving your entire body without being aware of it." Looks-wise this chair had me at "hello." Hag says you’ll smile when you see it, and they’re right. I did. And still do. But it doesn’t strike me as a sit-in-it-all-day kind of chair, no matter how much it "follows" me. I say, get a bunch and put them in your meeting rooms at work. That's a place that tends to need a little fun. if. you. have. to. ask. It was hard finding pricing for these, but they seem to run about $400 per chair. That's another good reason to get work to pay for it.